MD Anderson cancer immunotherapy pioneer Dr. James Allison has been awarded with yet another research award for his recent cancer therapy research, this time from The National Foundation for Cancer Research (NFCR). The Foundation announced last week that Dr. Allison, Chairman of the Department of Immunology at The University of Texas MD Anderson Cancer Center, has been awarded the 2014 Szent-Györgyi Prize for Progress in Cancer Research, specifically for his research that led to the development of “immune checkpoint therapy,” as well as the first FDA-approved drug for the treatment of metastatic melanoma. “I am honored to receive this distinguished award from the National Foundation for Cancer Research for my work in immunology,” said Dr. Allison in response to receiving the award. 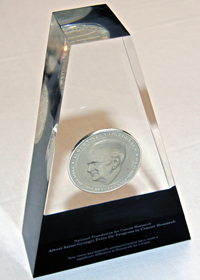 The NFCR’s decision to award Dr. Allison with the prize is based on the new era that cancer immunotherapy offers for oncology; while mainstream cancer research and treatment was predicated on radiation therapy and chemotherapy, Dr. Allison’s focus on immunotherapy — for a time seen as an approach only on the periphery — was steady and consistent. Now, his hard work and determination is beginning to pay dividends, which could come to impact millions of people worldwide in the coming years and decades. This breakthrough in T-cell research led to the development FDA-approved ipilimumab — the first cancer immunotherepeutic — which was at first approved to treat metastatic melanoma, and is now being tested to treat a variety of other cancers as well. Dr. Allison will be honored at an award ceremony held April 30, 2014 at The National Press Club in Washington, D.C.